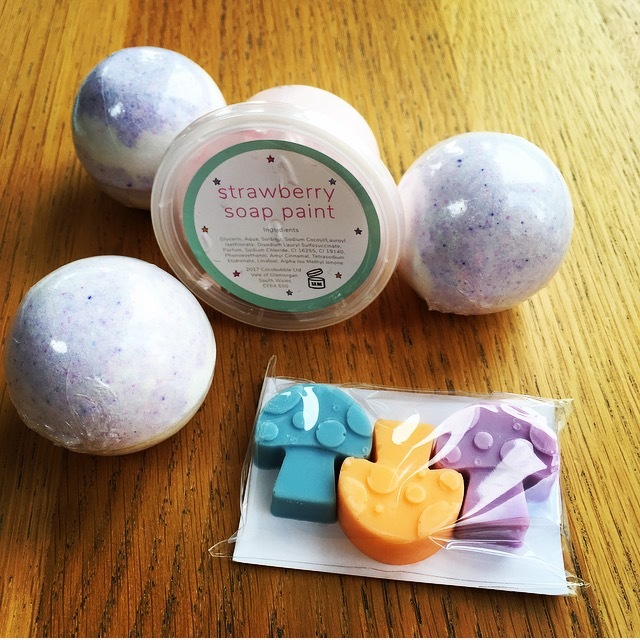 Cocobubble is a family business based in South Wales that is reinventing bath time with a range of child friendly bath bombs, soap paints and mini character soaps. 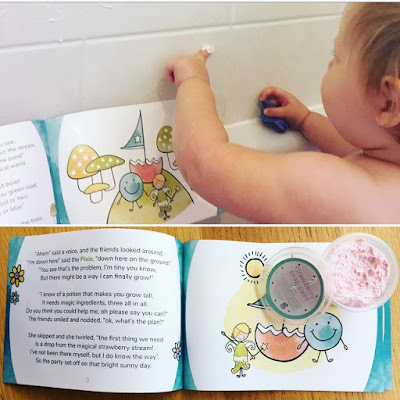 Cocobubble also sell innovative activity bundles, eco friendly toys and, yep you guessed it, a bath time book! 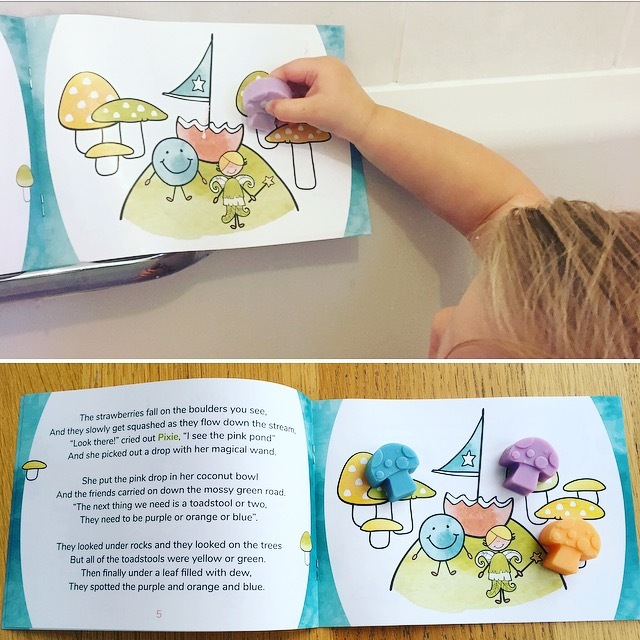 The Magical Wood is described as a bath time adventure book. It is made using a flexible, waterproof material so it can get splashed or even be fully immersed in the tub. Cocobubble also sell The Magical Wood bath bundle, which can be used along with the book to promote imaginative play and storytelling. We thought this sounded such an amazing way to brighten up any bath time. The Magical Wood bath book RRP: £7.50; The Magical Wood bath bundle RRP: £12.00; Three animal finger puppets RRP: £3.25 each. Let's take a closer look at The Magical Wood bath bundle. As you can see it includes a tub of strawberry soap paint; three fizz bud bath bombs; and three mini toadstool soaps. 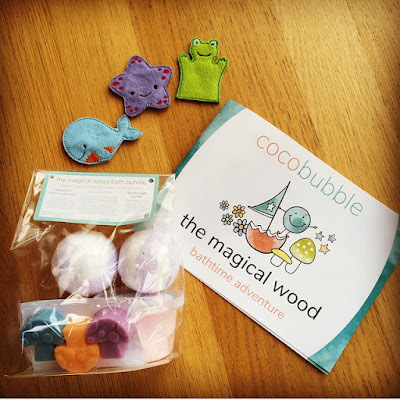 The Magical Wood book is a delightful rhyming story about two little adventurers, Coco and Bubble, and their journey through the wood to find things to help their new friend, Pixie, make a magical potion. 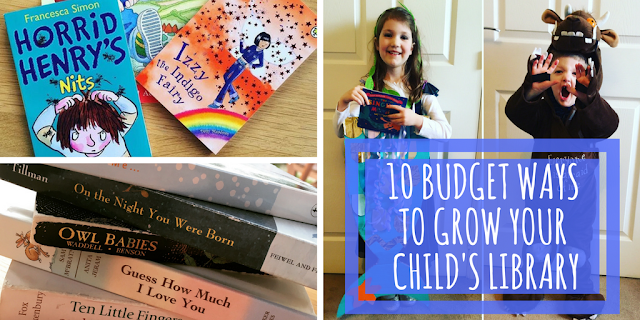 The story itself is quite detailed compared to toddler bath books we have previously read and therefore engaging for slightly older children too. 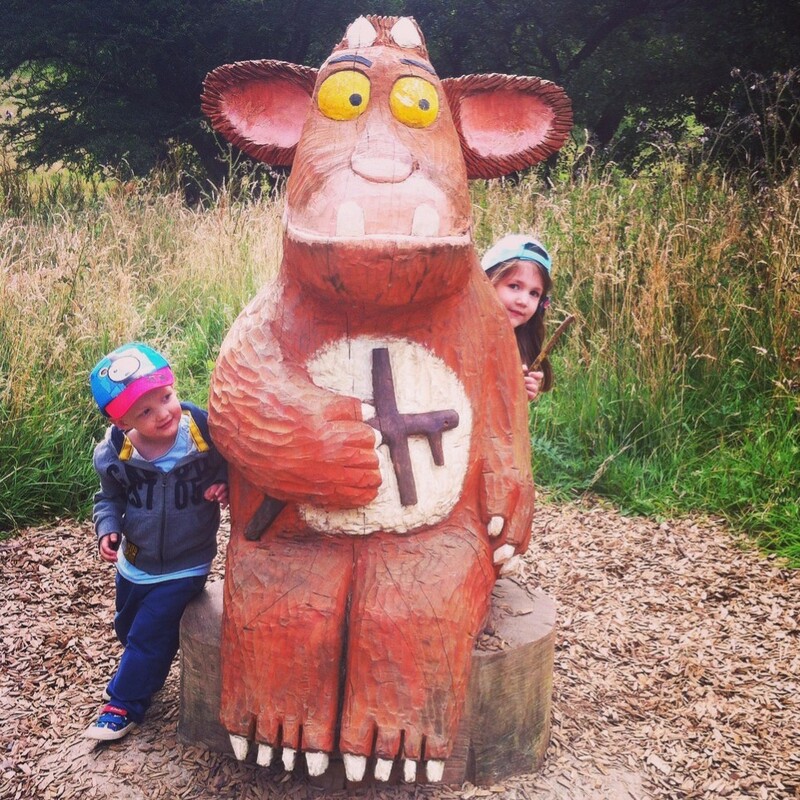 Izzie (5) was intrigued throughout. 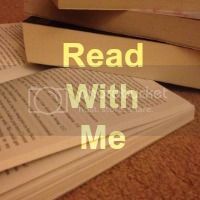 The book, although made from quite a thin material, was robust enough to be "shared" between the three Mini Reviewers and will be dried off and used again and again! 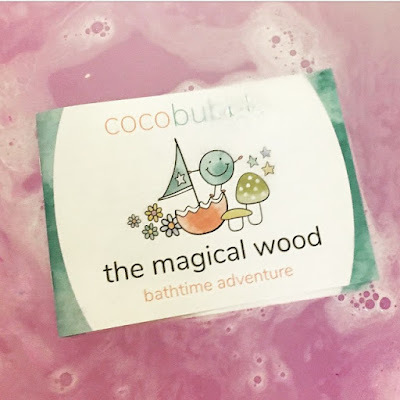 The Magical Wood bath bundle is full of the things that the characters in the story, Coco and Bubble, need for Pixie's potion - strawberry drops from the pink pond (soap paint), toadstools of orange or purple or blue (mini soaps) and a bud from the fizzberry tree (fizz bud bath bomb). All three Mini Reviewers were super excited to find the right things to add to their potion. 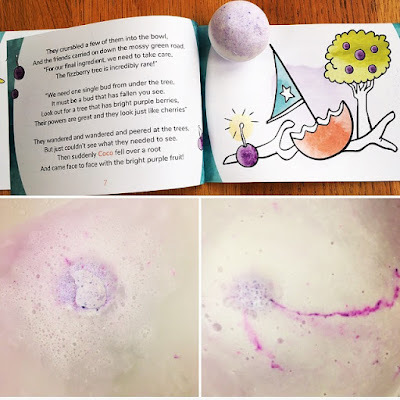 They matched them to the pictures in the book before adding them to the bath and mixing and swirling up the water. All the bath products looked and smelt amazing. The fizzing bath bomb caused great excitement but the biggest hit was definitely the strawberry bath paint. 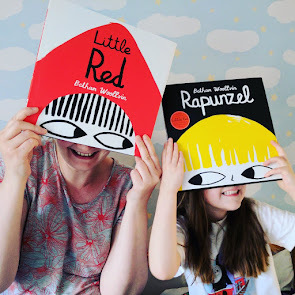 Poppy, in particular, was full of giggles and took great delight in painting herself, her brother, the tiles and me with the strawberry paint. Fortunately it doesn't stain! It has a fantastic almost fluffy texture and, although it was not the brightest bath paint we've tried, it certainly smelt the best. 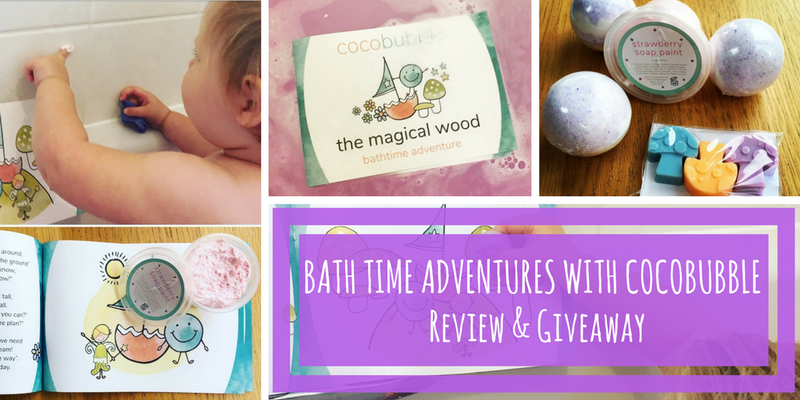 All in all Cocobubble made three little people and one big person very happy as it was the most successful and stress free bath time we have had for quite a while! There is a vast selection of fun activity bundles available from Cocobubble, we particularly like the look of the 'pigs in mud' and 'dinosaur adventure' sets. All the sets would make fabulous gifts for children so why not take a peek at the full range here. 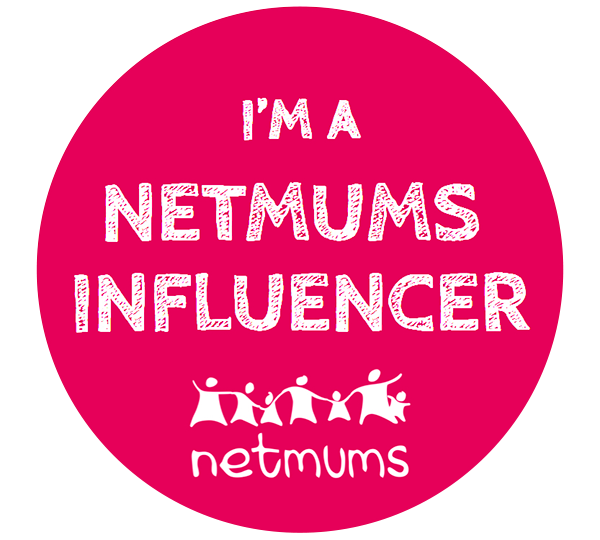 *Disclaimer: This is a sponsored post, however all opinions are our own. 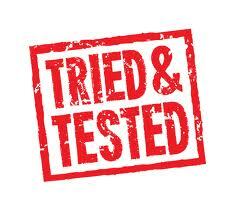 If your child has sensitive skin, please do a patch test before using any new product. A bubble machine great fun! My granddaughter's current favourite bath toys are a set of very realistic sea creatures including a blue whale, orca, dolphin and a great white shark. Boats, in a variety of colours. My children love their farm animals and paw patrol toys! A rubber duck & plastic cups. My grandson loves his boats. My children love foam letters - my oldest makes up funny words and my youngest just likes sticking them to the side of the bath. A Peppa pig boat toy is her fav! Her dolls, they like a bath too! this looks awesome my little guy would have lots of fun!! A squeaky rubber duck dressed as a ballerina ! Her set of light up ducks. A wow fire boat, he loves it! She loves small jugs and buckets and has quite a few of them. We love our Octonauts toys. My daughter loves playing with her Barbies in the bath. Although we have a lot of bath toys, my little boy prefers to play with the plastic jug I use to rinse his hair. He likes filling it with water then pouring it back out. Sadie just has a couple of empty bottles! She loves tipping them one to another and making "potions"
he loves his rubber ducks he as many designs he always gets them to have races. My kids love the bowls, spoons & whisks we keep in the bathroom. She's got a floating bath tea set complete with sugar bowl! Our daughter loves her stacking cups! She makes cups of tea, washes her hair, and pours water over herself with them! anything that gets me wet!!! My daughter actually loves the jug as her favourite bath toy. Empty shampoo or bubble bath bottles!!! My granddaughter loves this little jug and watering can and tipping from one to other. My children prefer empty shampoo bottles to bath toys, my bathroom always looks like a recycling centre. Foam letters, my eldest sticks them to her head, which the youngest finds hilarious. Plastic cups! He makes me cups of "bubbly coffee"
My niece has a carrier bag full of dolls and toy cars. my grand daughter who is 2 has a pink rubber duck that was brought in spain when my son went there and she loves it. Can't beat a good old rubber ducky! My daughter's favourite is a rubber duck! My Daughter loves her unicorns we got from Tesco! She plays with them every time! My little one's favourite toy is a water bottle haha he loves letting it fill up and then pouring the water all over himself! four little light up coloured ducks! I would love this for my niece, looks so much fun. My son loves a submarine that he pushes under the water and shoots up into the air when he lets go. Keeps him amused for ages! Our little girl loves her rubber duck! This is such a super cool idea. Thanks for sharing it on #KLTR We love bath bombs and the book makes the whole experience more fun.